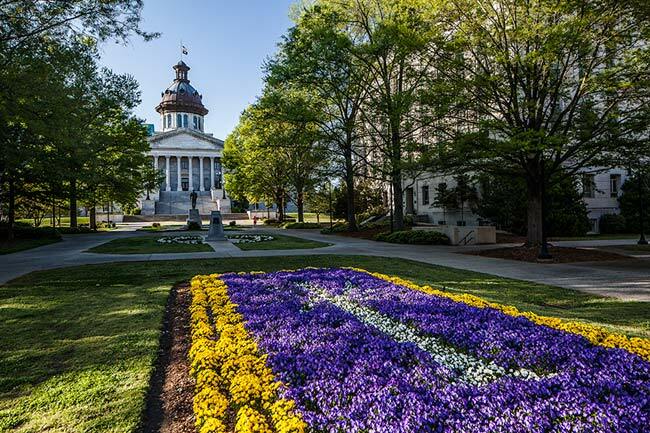 South Carolina’s first state house was located in Charleston on the corner of Broad and Meeting streets. 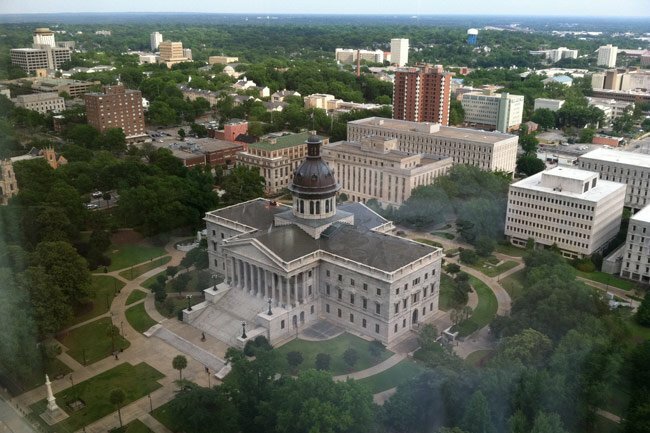 However, as settlements grew further inland, a number of South Carolinians wanted to move the State House to a more central location. A compromise was reached in 1786 when Colonel Thomas Taylor donated some of his land along the Congaree River for the new capital city. 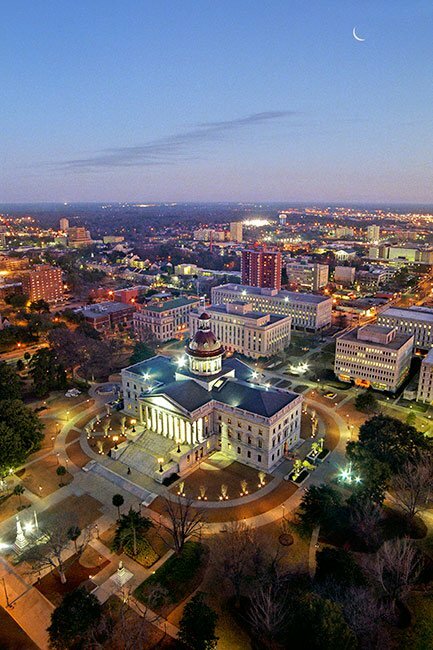 The new city was named Columbia, and the State House was built on a hill that was one of the most prominent points in the area. Though the project began in 1851, it took 56 years to complete, and the cost exceeded $3,450,000. The Civil War, along with corruption, lack of funds, and political bickering, interrupted the construction on several occasions. It was finally completed in 1907 by Hartsville native Charles Coker Wilson. 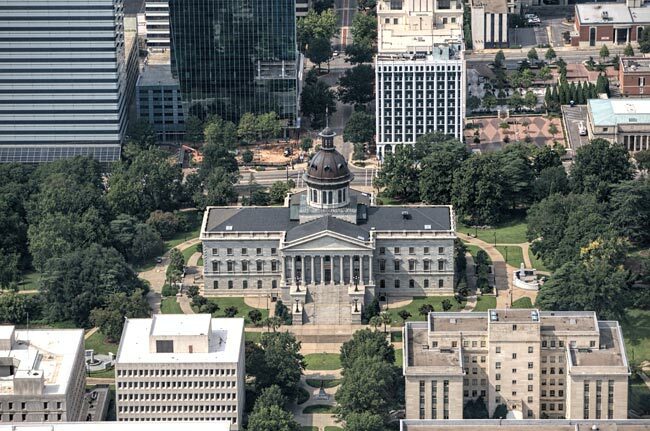 The building weighs more than 70,000 tons and is constructed of native blue granite, most of which came from the Congaree Quarry two miles from the site. 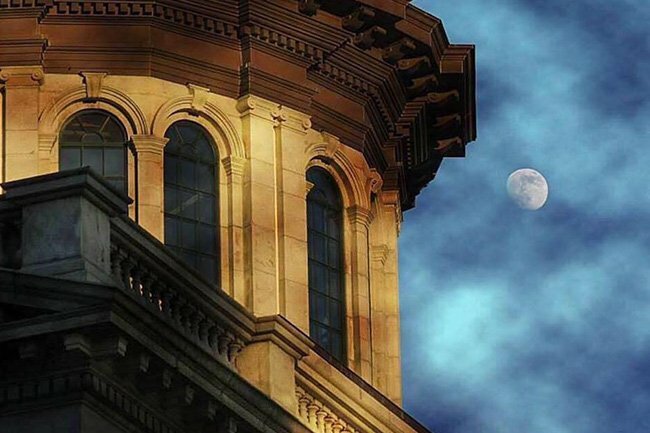 The iconic dome, seen above, was added to the state house between 1900 and 1902. 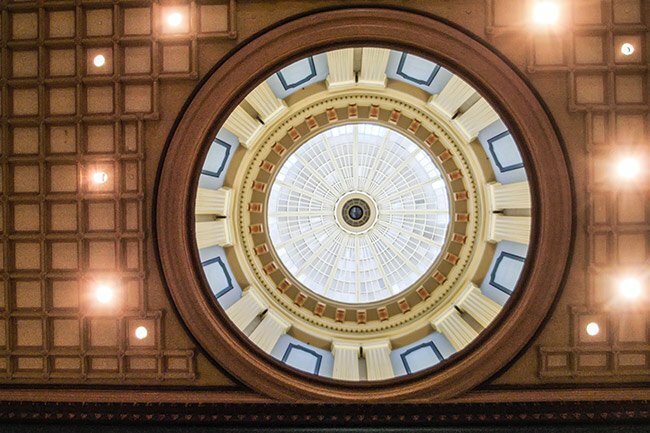 Designed by architect Frank Milburn, who is responsible for many South Carolina structural gems such as Holland Hall at Newberry College and the O’Donnell House in Sumter, the dome has a room that allows access to its top for the raising and lowering of flags. The dome’s exterior boasts 44,000 pounds of copper. Several monuments grace the state house grounds. 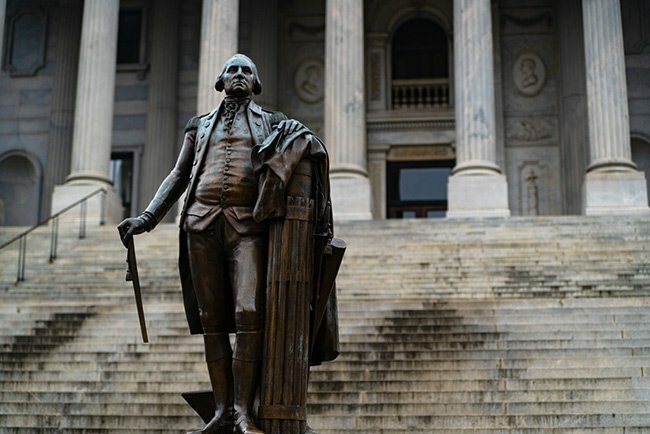 Below, the bronze sculpture of President George Washington is one of six replicas created in 1857 from the original 1789 sculpture of marble. The marble statue sits at the capitol building in Richmond, Virginia. 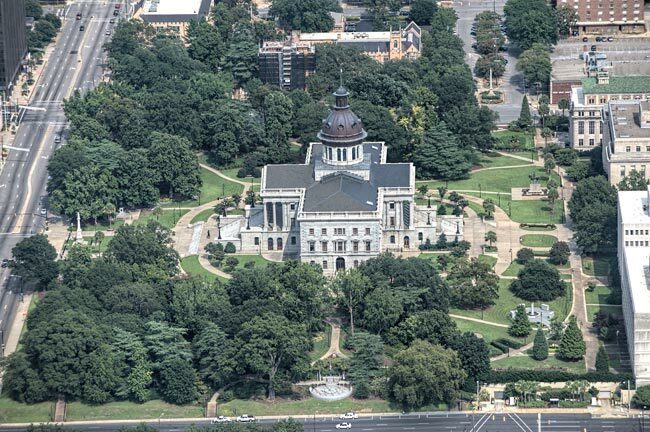 The website scstatehouse.gov claims that Washington’s cane on the South Carolina statue was broken during its placement on the state house grounds. However, the plaque on the statue says that it was intentionally damaged during General Sherman’s occupation of Columbia from February 17 through February 19, 1865. The Confederate Monument, seen below, was dedicated on May 3, 1879. The memorial was erected to honor Confederate soldiers who died during the Civil War. 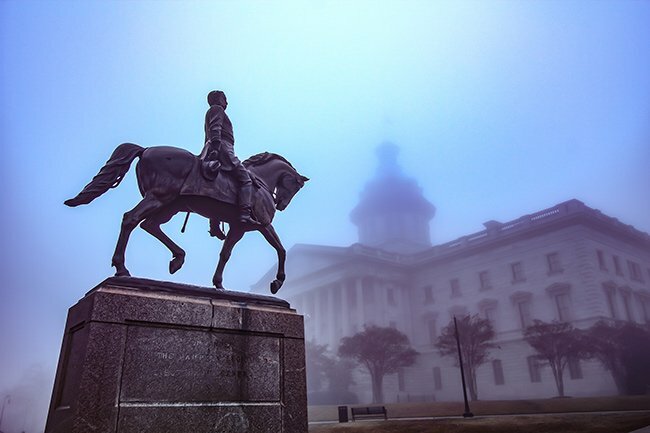 The statue was sculpted by Carlo Nicoli and is made of granite from the Congaree Quarry, just like the state house itself. 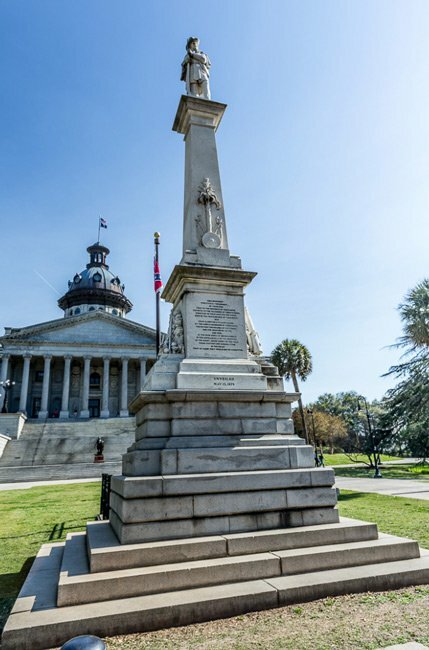 Seen in this picture of the Confederate Monument is the Confederate flag, also known as the South Carolina Infantry Battle Flag of the Confederate States of America. A similar flag with a rectangular shape, as opposed the more traditional square flag that is pictured above, waved from atop the state house dome from 1962 until July 1, 2000. 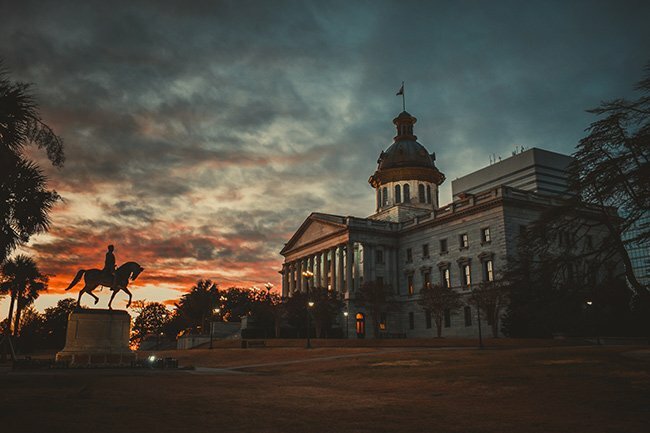 The state legislature voted 66 to 43 to remove the flag from the dome and place the traditional battle flag near the monument on May 18, 2000. The flag, which many say represents racism, continued to be a point of controversy until a vote for its removal was held on July 8, 2015. The flag was removed from the statehouse grounds on July 10, 2015 and moved to the Confederate Relic Room and Military Museum. Above is part of the African-American Monument, installed in 2001 as part of the compromise that saw the Confederate flag moved from the statehouse dome to the grounds near the Confederate monument. The African-American Monument is the work of Colorado sculptor Ed Dwight, who has created several works of art celebrating African-American life. 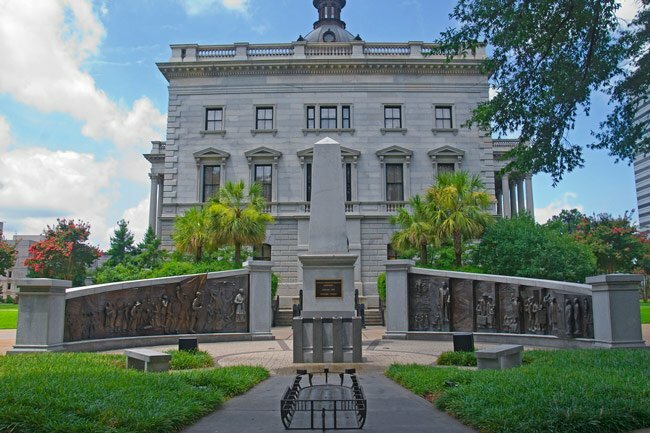 Standing two floors high and spanning 25 feet, the memorial tells the story of African-Americans in South Carolina from the slave trade to the modern age in 12 panels. An obelisk bearing a plaque in honor of Dwight stands before the monument, and an image representing human bodies packed into a slave ship rests on the ground on front of the obelisk. The monument can be seen in the bottom right-hand corner in the above aerial photo. The above life-like iron sculpture of a palmetto tree – the South Carolina state tree – was created by master iron wright Christopher Werner of Charleston. Werner is known for other works in Charleston such as the sword gates at The Citadel and the wrought iron work at the John Rutledge House. 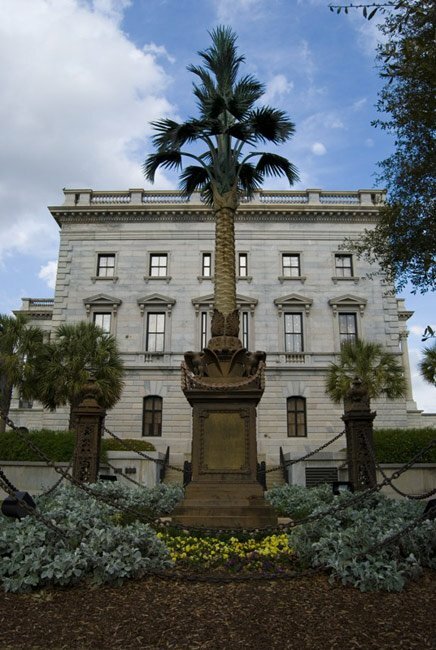 Werner’s palmetto tree was dedicated in 1858 and is the oldest monument on the state house grounds. It honors the members of the South Carolina Palmetto Regiment who died during the Mexican War in 1847. 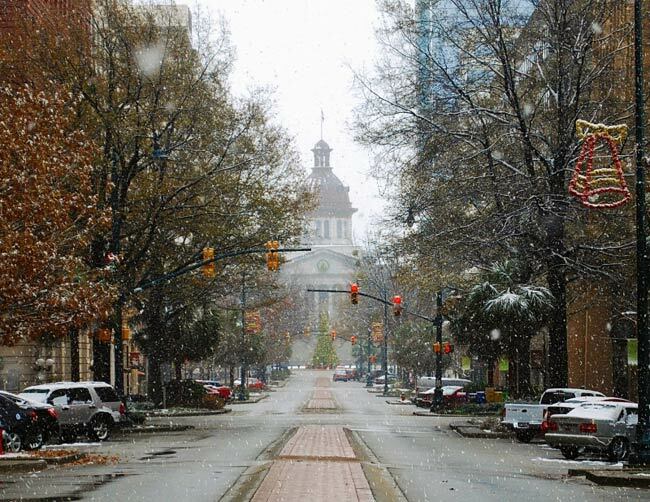 Several state office buildings near the South Carolina State House comprise the downtown pedestrian complex, including the Wade Hampton Building, which has served residents since the 1940s. There are also more contemporary structures such as the Blatt Building, the Gressette Building, the Rembert Dennis Building, and the Edgar A. Brown Building which were added in the 1970s and 1980s when Senate Street was removed in this area to create the walking-only government grounds. 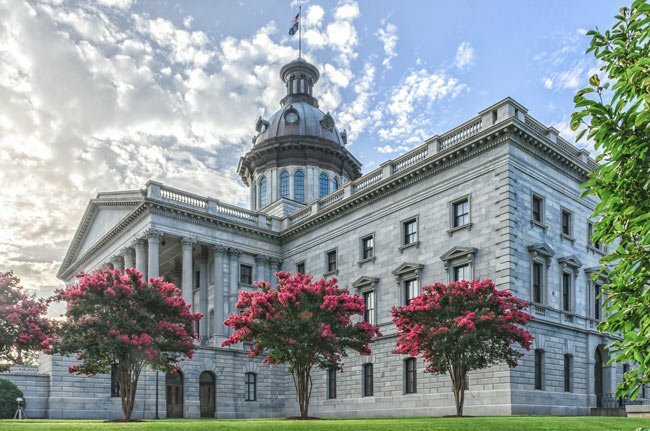 The South Carolina State House makes for a fascinating day trip for those interested in the history of the Palmetto State. Free guided and self-guided tours of the capitol building are available for groups. Walk-in visitors are welcome, though groups larger than 10 must have a reservation. 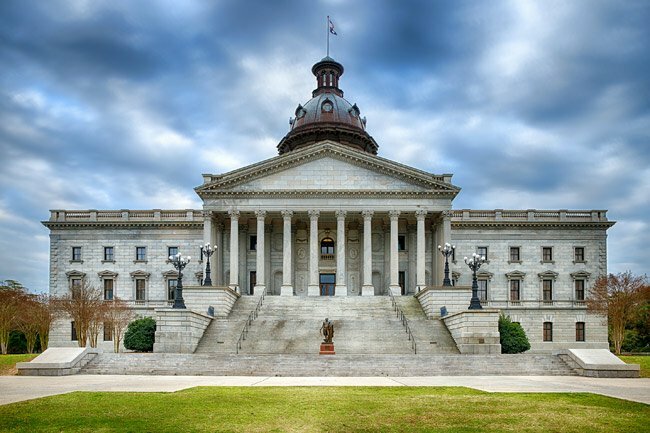 An example of Neo-Classical architecture, the South Carolina Statehouse is a three-story, domed edifice of granite, marble, brick and iron. Vienna-born architect John Niernsee began the structure in 1851, but the Civil War and post-war poverty slowed progress on the building. 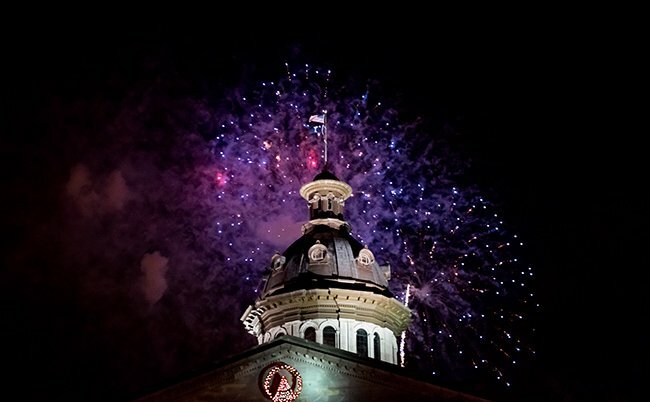 For unknown reasons, the building was spared in General W. T. Sherman’s 1865 burning of Columbia, though the structure did suffer damage from shelling and burning of the nearby old statehouse. Following the Civil War, between 1869 and 1874, the only state legislature in American history with an African American majority sat here. In 1876, the Democrats, lead by Wade Hampton conducted the “Red Shirt” campaign against Daniel H. Chamberlain and the Republicans. Both sides claimed victory and two speakers and two Houses began conducting deliberations in the same hall. On April 10, 1877, fulfilling part of the compromise that had allowed his inauguration, President Rutherford B. Hayes withdrew Federal troops. The following day Hampton and his supporters assumed full control of state government. From 1888 to 1891, Niernsee’s son, Frank McHenry Niernsee, served as architect and much of the interior work was completed. In 1900 Frank Milburn served briefly as architect, but was replaced in 1905 by Charles Coker Wilson who finally finished the exterior in 1907. 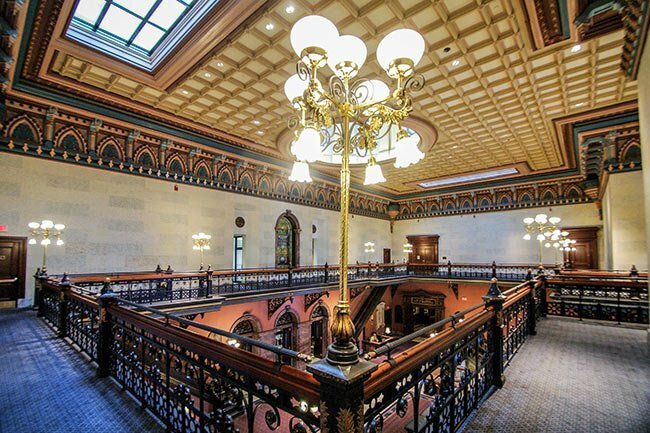 Take a virtual tour of the State House! Thanks, we have that updated! Great site, good information and beautiful photos but your map marker is off by 4 city blocks. Thanks.